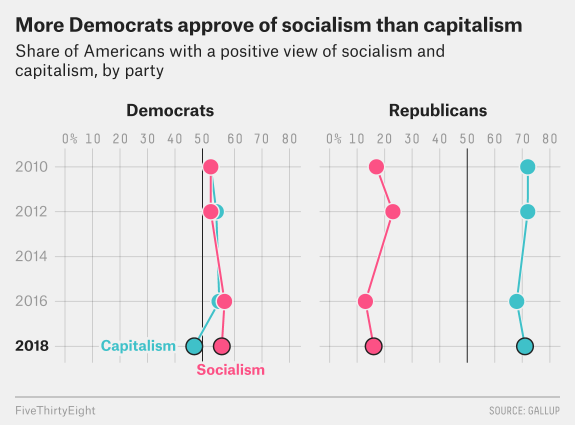 Do more Democrats approve of socialism or capitalism? What the What?!?! How accurate was your prediction? How surprised are you by this data? What is the big story the chart tells? Describe some of the main differences between capitalism and socialism. Why do you think more Democrats approve of socialism than capitalism? How will this impact the nomination process for the 2020 presidential election? Identify some Democratic party leaders who you associate with socialist beliefs. Identify some Republican Party leaders who you associate with capitalist beliefs. The goal of a political party is to turn it’s beliefs into policy by winning elections. In terms achieving these goals, explain whether you think that the shift of Democrats towards socialism is good news for the Democratic Party. Democrats are generally associated with a liberal political ideology. Explain whether liberalism is compatible with socialism. Republicans are generally associated with a conservative political ideology. Explain whether conservatism is compatible with capitalism? What is one trend you see in the chart? Explain whether independent voters would be more attracted to capitalism or socialism? Are capitalism and socialism mutually exclusive? What is one policy that a democratic party moving towards the left, towards more socialism, would be likely to endorse? What is one policy in American government that is a result of the influence of Capitalism? What is one policy in American government that is a result of the influence of socialism? How much do you think the echo-chamber of social media has contributed to this leftward slant of Democrats, and rightward slant of Republicans? In the past, the chart above would have had more people smack dab in the middle. What has happened to those people and how does the lack of a center impact gridlock in American politics (border walls, government shutdowns, etc.)? Imagine you are one of the 10% of Republicans who have a positive view of socialism. What do you imagine is the main reason these people are Republicans instead of Democrats? The Federalist argues that most young people who like socialism don’t really know what it is! Do you think most old people who like capitalism really know what it is? Based on your knowledge of American politics, respond to the Federalist’s claim above. Read this FiveThirtyEight story about millennials and socialism. Then check out some of the young folks in this year’s POLITICO50, Politico’s list of 50 ideas driving politics (and the people behind them). Share the idea or person that you find most interesting on social media or by word of mouth.